“I want to see something that will make me go, Oh my God – with a pause – Oh. My. God,” a Boston acquaintance asserts with the enthusiasm of someone who has figured out precisely what is missing from the spaghetti sauce. The Fall 2012 Nicholas K collection sometimes channels the Wild West. Photo by Mike Coppola/Getty Images. At the time of this epiphany last night, we are milling about the lobby of The Shops at The Plaza watching Yuna Yang’s intermittent presentation in progress. The remarks of this boutique owner, an exquisite lady of a certain age, are informed by the fact that she is back in the bosom of Mercedes-Benz Fashion Week New York for the first time in an age. (She spoke wistfully of the era when the incomparable Naomi Campbell ruled the runways). “The models make the clothes,” declared she. Acquaintance is also being rather loquacious because there are no OMG! moments at YY, though a couple of looks merit trifling recognition w/caveats. A moss green gown with draping at the bodice, perhaps representing the fairytale sphere of the fairytale/real world/androgynous triangle the designer seeks to evoke in a collection inspired by Virginia Woolf’s “A Room of One’s Own,” has promise. It can benefit from a re-do in something other than Japanese tensile jersey and relief from that interfering white or silver lining. My attention is drawn to a shirt dress in electric blue for no other reason that the color is rather brilliant in bright sort of way. Whereas Acquaintance wants OMG!, Yours Truly will settle for the lesser superlative, Wow! The first day of MBFW lacked any Wow! moments but as I alluded yesterday (http://www.bit.ly/wchnAD), Nicholas K is back in the saddle after taking a spill in September with a rather lethargic, white-heavy collection. (See video above). 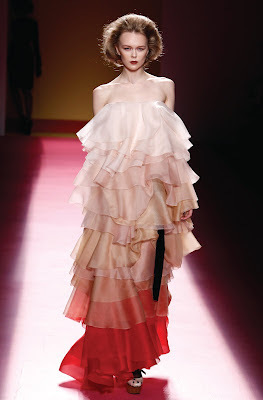 For Fall 2012, BCBG Max Azria seems disconcertingly familiar. Photo by Frazer Harrison/Getty Images. Designer Nicholas Kunz does not state her inspiration, however, it is clear that she is taking cues from the Wild West. The cowboy hats, fringe and maxi coats are obvious touchstones. Here, too, is some Asian influence, most notably represented by deconstructed jackets, as well as the asymmetrical mohair jackets that whisper of Mongolia. Hints of the Flapper period also pop up, the biggest clue being pin-thin, bedazzled fringe. Not to complicate matters too much, a number of men’s jackets are constructed to the point that their wearer would be permitted to dine in certain fine establishments. And what of those eye-catching shell-like necklaces for women? Whatever the influences, they are combined and the effect is mostly pretty darn cool. Witness for women, the black asymmetrical leather jacket w/lazy collar and leather fringe at hem. It is worn over black leather skinny pants and worn under a mohair shrug with leather fringe. Atypical for the Nicholas K man but retaining the quotient cool is the constructed jacket and pant in gray, accompanied by gray shirt and gray outwear jacket (w/sleeves scrunched up) topped off by a black cowboy hat. In a collection of 54 looks, most composed of at least three pieces, there are bound to be a few that don’t compute. I give you the Maya dress in teal with draping at bodice and hips along with the gray, fringed flapper dress, suggesting that the designer is out of her comfort zone with one-piece affairs. Meanwhile for men, the black jacket, gray cableknit sweater and gray two-tone haremlike pants ensem a tad pedestrian. Alas, it ain't got that swing. Megla M. combines two loves into one garment. Photo courtesy of Megla M.
What else can be said of Day 1? 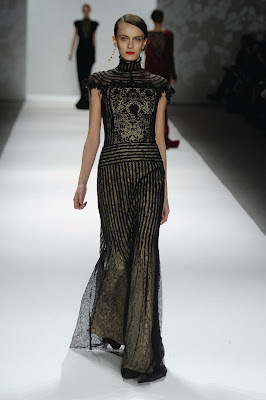 Let’s see Tadashi Shoji showed a competent, yet unremarkable evening wear collection. Gotta love Max and one does. Alas, it looks like designer Azria called in the Fall 2012 BCBG Max Azria collection from his villa on the Italian Riviera (or some similarly swanky locale). It is a continuation of Spring 2012 (or is retread the word?) done in hues more muted with the addition of fur hideous. Megla M designer Stamatia Megla combines her love of both fashion and theater to spawn two quilted kimono-style gowns w/bustles that show promise as does an insouciant black quilted bubble top with dolman-sleeves. The London-based, Greek-born designer makes her U.S. debut with the caption collection. Another on the NOLCHA Fashion Week 2012 bill with MM at the Alvin Ailey Dance Studios was Vassilis Zoulias who proves that he has hattitude and therefore one day will design hats that will be the envy of Ascot. Photos by Frazer Harrison and Joe Kohen/Getty Images. Photos by Mike Coppola and Mark Von Holden/Getty Images. Visit http://http://www.mbfashionweek.com/ to learn more about Mercedes-Benz Fashion Week, including show information and videos; visit http://www.nolchafashionweek.com/ to learn more about NOLCHA Fashion Week 2012.